This past weekend Don took me on a surprise getaway for my birthday…this has sort of been the tradition for the past 4 years haha. Do I expect it…sorta…haha. He is the best. We left Friday (June 21) after work around 6:30. The drive wasn’t too bad and it only took about an hour and a half or 2 hours. 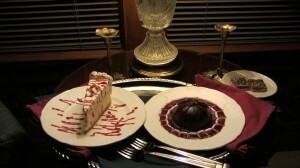 The destination was a bed and breakfast in La Porte, Indiana called Arbor Hill Inn. We arrived around 8 and checked in. The place looked very nice. The outside of the B&B looked cool. We were very hungry so we decided to go out and eat. 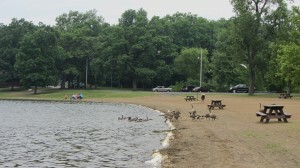 When we left Arbor Hill Inn I could see there was a very large lake nearby. 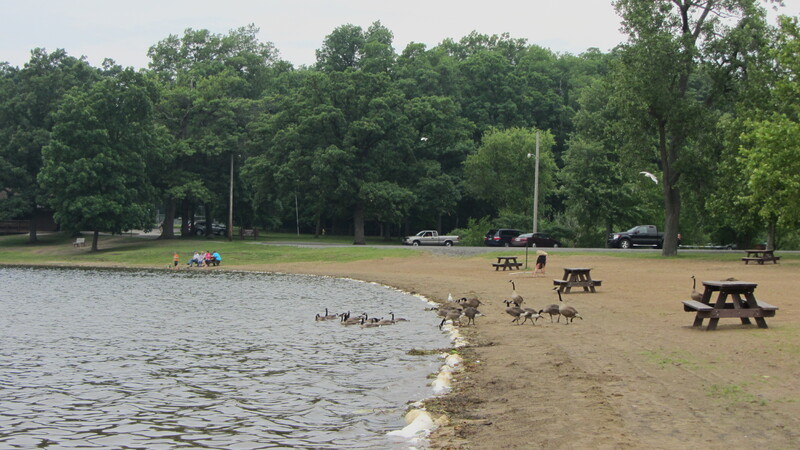 The lake was called Pine Lake. There are a whole bunch of lakes in La Porte. We decided to eat at Mexican restaurant nearby that had very good reviews. It was called La Bracero. The food was great. When we came back to the B&B there was dessert waiting for us. This was one of Don’s surprises. There was a cheesecake and a chocolate mousse type of thing, it was the Arbor Hill Special. The next morning we woke up and went to breakfast around 8:30. 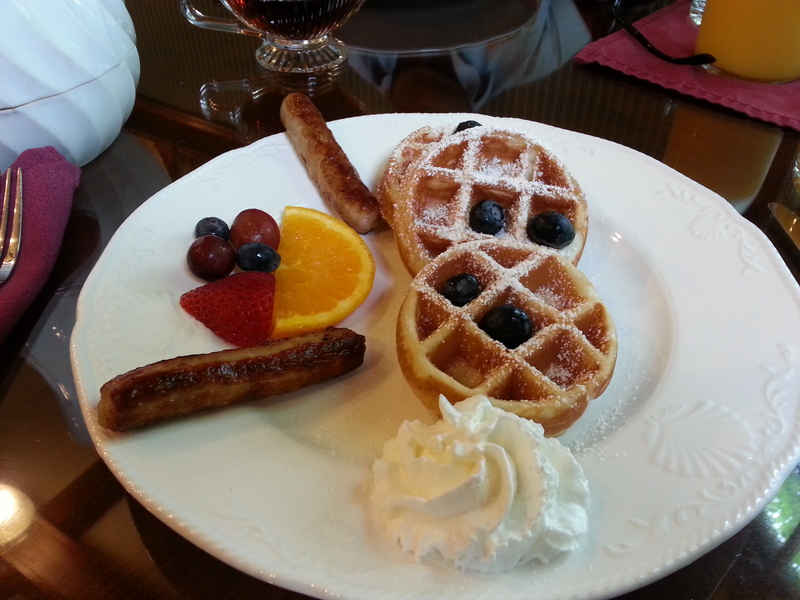 Breakfast was sausage, fruit, and mini waffles. I am usually not a fan of waffles but these were delicious. After breakfast we went to Stone Lake. We hung out for awhile and relaxed. Then we decided we would grill here. Don of course brought a ton of stuff to grill haha so we were grilling for awhile. 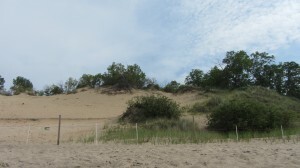 At around 3 we decided to go over to Indiana Dunes State Park. It was about a 20 minute drive. We stopped at Mount Baldy. 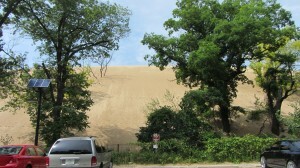 Mount Baldy is a big sand dune. 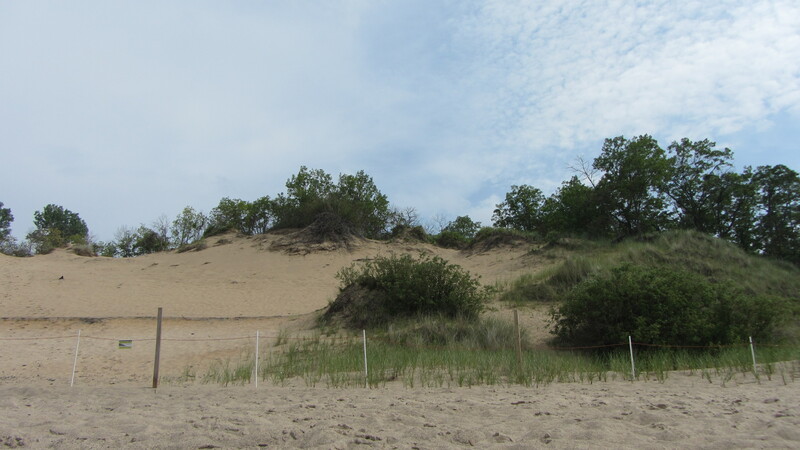 We hiked around it to get to Lake Michigan. Usually you can climb up to the top of Mount Baldy but the trail was closed off. 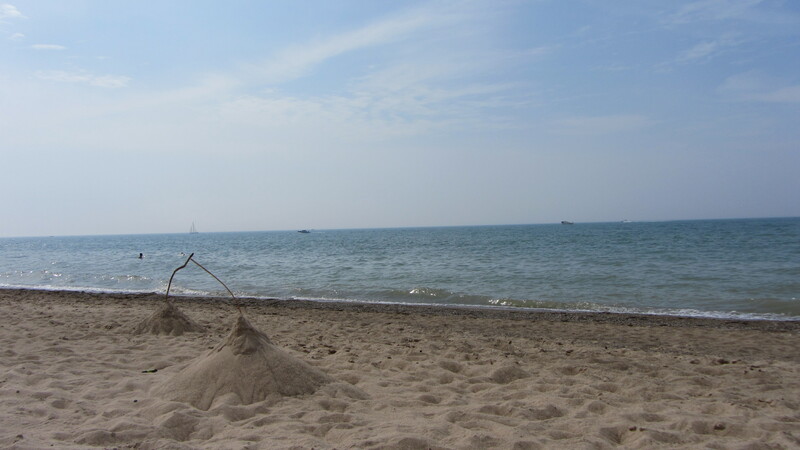 It was really cool looking and Lake Michigan was beautiful as always. Then we went back to the B&B and got cleaned up. We wanted to check out a Polish Festival in town. There wasn’t much at the festival but we each got a Polish Sausage and a beer. Then we decided to go to Buffalo Wild Wings to watch the Blackhawks/Boston Game 5. The Blackhawks won so that was great! It was a really good game. On Sunday we woke up and had breakfast about the same time. Breakfast was french toast with sausage and fruit. It was okay. We got all of stuff and checked out of the Arbor Hill Inn. Then we drove over to Michigan City so we would try Shoreline Brewery. We first stopped by an outlet mall near the brewery and Don got some new dress shoes. We got a beer flight at Shoreline. Most of the beers were pretty good. And there was enough in each glass for us both to try them. We then ordered Fried Pickles and the Scotch Egg appetizers. Both were great. I think the Fried Pickles were some of the best I’ve had. Then we had the Fried Calamari because it was different, it had feta and banana peppers in it. We also ordered the pork sliders. The pork sliders were not as good as they sounded. 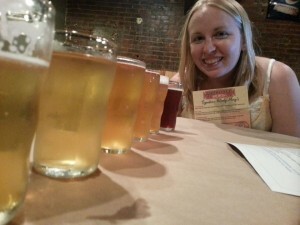 Overall though I was happy with Shoreline Brewery. We got carrot cake for dessert. It was a little too big but good. 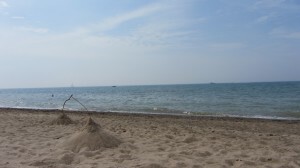 That was how we ended our weekend getaway…..can’t wait for the next one!